By buying this product you'll earn up to 725 Rewards points. 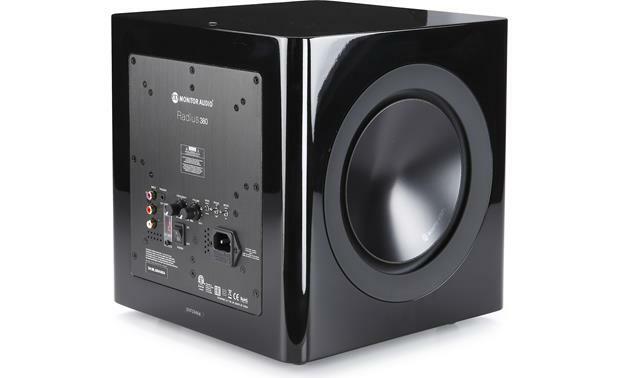 When Monitor Audio visited recently, they brought along their compact Radius R380 powered subwoofer, and set it up in our large, acoustically challenged product training room. Formerly a three-car installation bay, this room makes speakers work hard to fill the space with clean sound, and it's especially tough on small speakers. 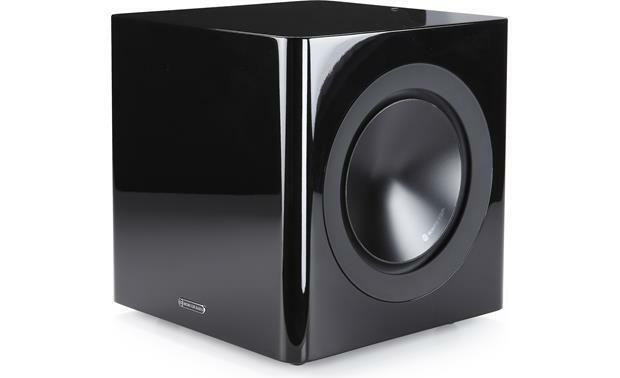 To be honest, when we saw the pint-sized R380, we didn't expect to be bowled over by its sound. Boy, were we wrong! Monitor began the demo by playing their tiny Radius R90 bookshelf speakers by themselves, which, by the way, sounded surprisingly full in our big room. But when they switched in the R380, jaws dropped. This little dynamo was kicking out tight, solid bass that effortlessly filled the room with nary a hint of strain or distortion. Heads were bobbing and feet were tapping as the sub went through its paces. 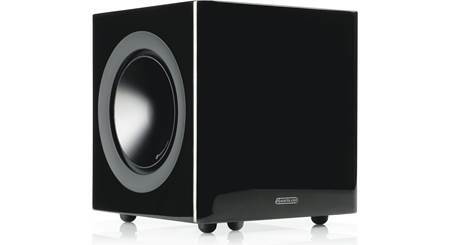 If the R380 could dominate our massive room, just think how good it will sound in yours. The keys to the R380's powerful performance are its brawny 200-watt Class D amplifier and advanced driver design. 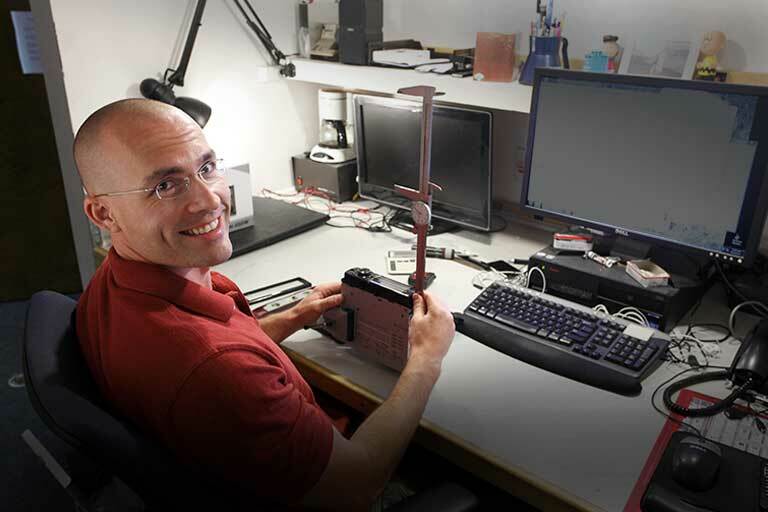 Housed inside the R380's enclosure are twin, side-firing 8" drivers working in tandem — one powered and one passive. Each cone is made from a lightweight, ceramic-coated aluminum/magnesium alloy originally developed by the aerospace industry for jet engine components. This ultra-rigid material resists the bending and twisting that causes distortion while allowing the use of thinner, lighter, more responsive materials. 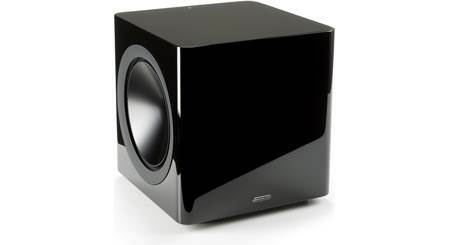 The result is tight, fast, and tuneful bass with exceptionally high output levels. Twin Side-Firing 8" C-CAM Drivers: The Monitor Audio Radius 380 features twin side-firing 8" C-CAM drivers; one active 8" cone woofer and one passive 8" ABR (auxiliary bass radiator). 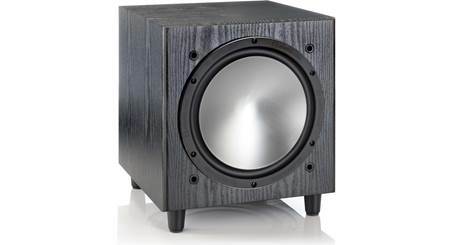 The two drivers work in tandem to reproduce very clean, deep, and dynamic bass frequencies. 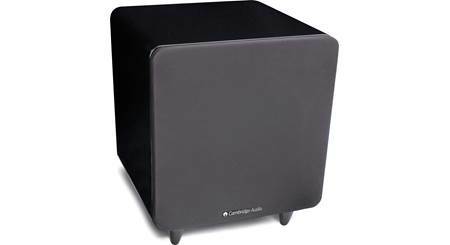 C-CAM Woofer Technology: Refined over many years by Monitor Audio, C-CAM (Ceramic-Coated Aluminum/Magnesium) woofer technology is used in the Radius 380 Powered sub. Originally developed by the aerospace industry for jet engine components, C-CAM's properties are ideal for subwoofer cones being extremely rigid, yet light enough to yield high overall efficiency. C-CAM bass drivers are able to resist the bending distortion imposed by sudden and extreme bass excursions to reproduce very clean, deep and dynamic bass frequencies. Conventional cone materials are more likely to flex in operation, producing a significant level of audible distortion. 200W Class D Amplifier: The Monitor Audio Radius 380 utilizes a powerful 200W Class D amplifier to drive the 8" C-CAM woofer. The 200W Class D amplifier is highly efficient, runs extremely cool, and offer distortion free bass. MDF Cabinet: The Radius 380 powered sub features a durable 18mm MDF cabinet with internal bracing. The MDF enclosure is rigid and protects against unwanted vibration and distortion. 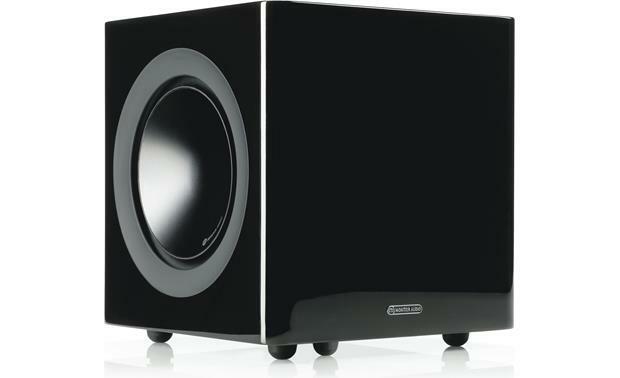 Bass EQ: The Radius 380 powered subwoofer offers Impact, Movie, and Music presets for easy EQ operation. Movie mode provides a relatively flat response down to 35Hz. Music mode is -2dB down from Movie mode but goes lower, all the way down to 30Hz. Impact mode is +3dB up from Movie mode and comfortably goes down to 40Hz. 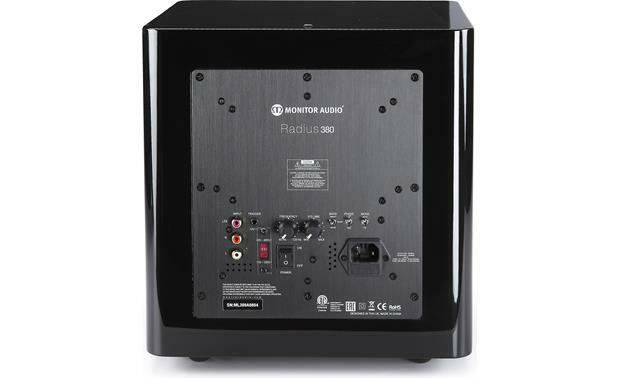 LFE/RCA Inputs: The Monitor Audio Radius 380 powered subwoofer is equipped with a dedicated LFE input and a stereo RCA input to connect the powered sub to a variety of AV receivers or integrated amplifiers. 12V Trigger Input: A 12V trigger input (3.5mm) syncs the Radius 380 powered sub with other AV components when the system is activated. The Monitor Audio Radius 390 uses a 10" driver array and a 220-watt amplifier to deliver added bass depth and impact to your listening room. 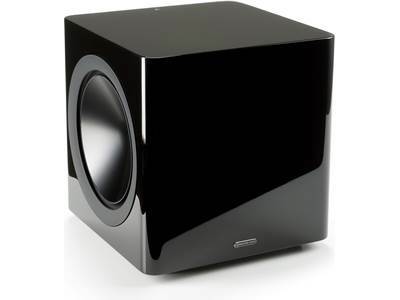 Searches related to the Monitor Audio Radius 380 Compact powered subwoofer.